Alternator and Generator both are electro-mechanical machines which converts mechanical input to electrical output i.e., electrical energy.Though output of the both machines electrical power, there are some key differences between alternator and generator are there in terms of design type of power etc. What is the difference between an alternator and a generator? But using commutator we convert to DC power. Alternator generates higher output than Generator. Generator generates lower output than Alternator. Alternator generates alternating EMF at its output terminal. Generator generates constant EMF at its output terminal. But internally it is alternating in nature. output rotating armature and rotating magnetic field are used. It works on faraday law of electromagnetic induction. It also works on faraday law of electromagnetic induction. In alternator we take supply from its stator. In generator we take supply from rotor. 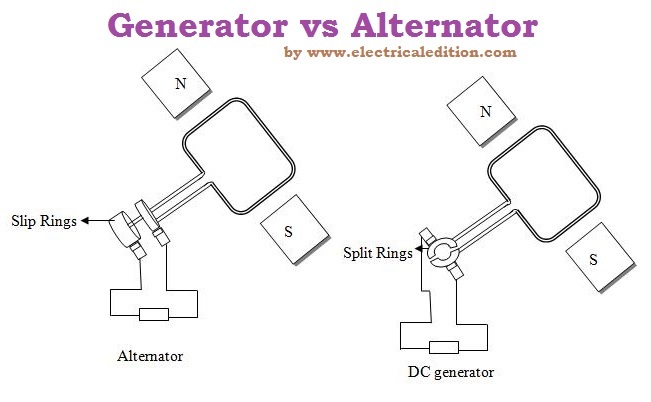 It is a major difference between alternator and generator.